There's plenty of evidence supporting the idea that aliens could exist somewhere in the universe. But space is unfathomably large, and the chances of us ever finding another intelligent species before we wipe ourselves out clean are pretty slim. Even still, we have geniuses at NASA, various universities and other space agencies mindlessly searching the vast open area for life. That's the sweet-spot around a star where it isn’t burn-your-face-off hot or freeze-your-balls-off cold. It’s the first thing scientists look for when trying to find life. Yet, even if a planet is in the habitable zone, there is a necessary factor for life we can't look for with fancy telescopes — time. There needs to be at least one generation of stars to live and die before we get any of the heavy elements needed to produce planets with life, and, at the age of 13.7 billion years old, our universe is relatively young (with the sun being only a third generation star). Even if there is a sun with a planet capable of supporting life, it still takes an estimated 4.6 billion years (according to Earth standards) for intelligent life to develop. And with all the things that can wipe life out in an instant, like gamma ray bursts, giant meteors, nuclear war and supernovas, the window of time for finding intelligent life is even smaller. Yet none of that stops people from searching for aliens. Some people point to signs that Venus and Mars could have once had the atmospheres to support life, but even the most compelling evidence hasn’t yet shown anything past the micro-organism stage. Maybe aliens were hanging out with humans at the dawn of time? Some believe so. But what a race of highly intelligent space travelers would want with a bunch of semi-hairless apes whose fist recorded attempt at humor was a fart joke baffles even the most staunch conspiracy theorists. Sure, aliens could have helped humans build their monuments — but you'd also be amazed at how easy it is to build a giant 3-D triangle with 20,000 extremely skilled and dedicated workers who are also full-time slaves. The second thing scientists look for in the search of life is technology. It's a common held belief that, if intelligent life exists, they probably developed similar communication styles to humans. And if they did, we could have a chance of picking up their signals. In other worse, we constantly have huge satellite farms scanning the universe for unnatural frequencies from alien planets. We've found some interesting stuff, too. Back in 1977, one of the most infamous signals in the search for alien life was received by Ohio State Universities' Big Ear Radio Telescope. The transmission, known simply as the Wow! Signal, was a massive spike in radio frequencies coming from the Sagittarius Constellation. It lasted less than a minute before disappearing and never returning. Though there was controversy surrounding it over whether or not the signal was from aliens, comets or some kind of mechanical error. But later, in 2012, humans sent a response of 10,000 Twitter messages to the same region the original signal came from (Because nothings screams "intelligent life" quite like Twitter). Beaming tweets at a constellation wasn't humanities first attempt to tell aliens 'we out here' looking for friends to kick it with. In 1974, Carl Sagan and a team of astronomers in Puerto Rico, blasted the Arecibo Message into space. In scientific terms, the Arecibo Message was simple, it featured an outline of human DNA, a rough image of what we look like, and a map of our solar system all transmitted in binary code — something a species with computers like ours would understand. 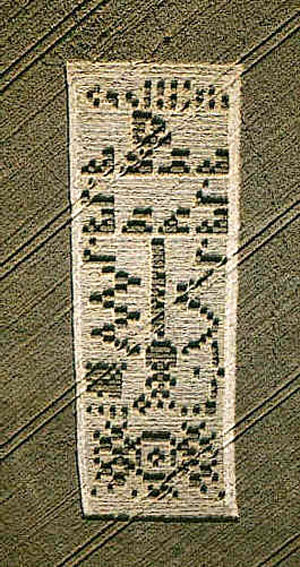 In 2001, the world received a response in the form of a crop circle that featured an alien variation of the original transmission. It was initially ruled a hoax, but it does have an amazing level of intricacy. Maybe a highly intelligent species thought it was better to respond with some smashed plants instead of a radio broadcast? It's not impossible. The universe is massive, so finding another species in our own lifetime is extremely far-fetched. But if we're lucky, there are aliens looking for us, too. And maybe we'll meet. And, assuming we don't blow each other's planets up first, we could be one step closer to living in the Star Wars universe. You just never know.